– is comprised of community-led recovery representatives and agencies active in long-term recovery. – works closely with these organizations to improve coordination, provide networking opportunities for the benefit of the survivor, and to reduce duplication of efforts and resources. – provides mentoring to new community recovery leaders, shares best practices, and builds capacity in communities for long-term recovery following a disaster. Community Recovery Team The Community Recovery Team, Inc. (CRT), a California non-profit, charitable corporation under IRS section 501(c)3, and is a member in good standing of the San Diego chapter of Volunteer Organizations Active in Disaster (SDVOAD). The Regional Community Recovery Team (RCRT) is a network of non-profit, community-based organizations (CBOs), faith-based organizations (FBOs) and governmental agencies active in disaster recovery, operating in San Diego County, the fifth largest county in the United States. Collectively, we form the infrastructure of disaster recovery services for the San Diego region. We are dedicated individuals with a common goal. We are determined to assist those that suffer financial and/or personal loss during and after a natural disaster. 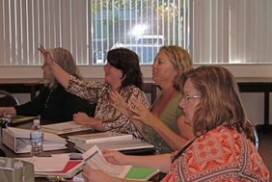 A Board of advisers comprised of CRT leadership guides the RCRT.